Recent new price highs in the NYSE composite index (NYA) were not confirmed by several indicators derived from the NYA components. 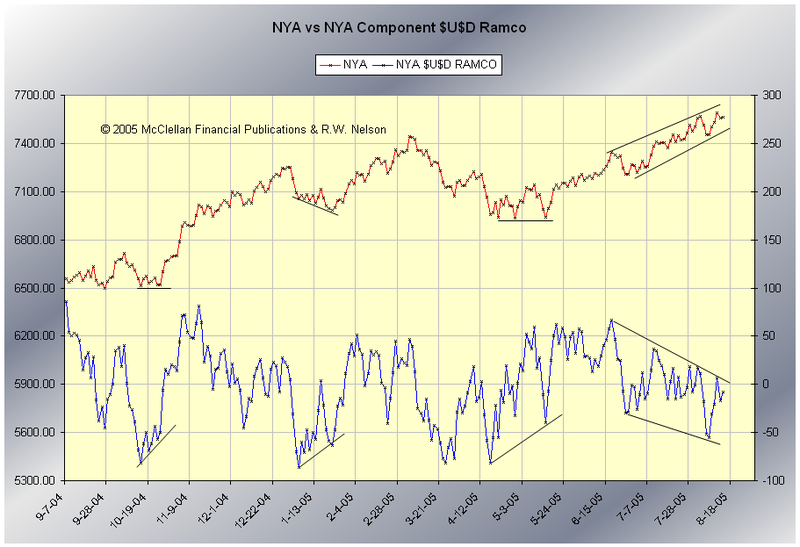 The following NYA related charts are a by-product of an “in process” collaboration with Tom McClellan. The complete results of the project will be covered in the McClellan publications in late summer/early fall. The first chart is a comparison between the traditional weighted NYA index and an un-weighted NYA index resulting from deriving the daily percent price change of all NYA components (currently 2065 issues) and averaging the collective price changes. This is the same approach referred to as “QCHA” published by Barron’s for the three major exchanges. The below chart is limited to the common-only stocks traded on the NYSE. 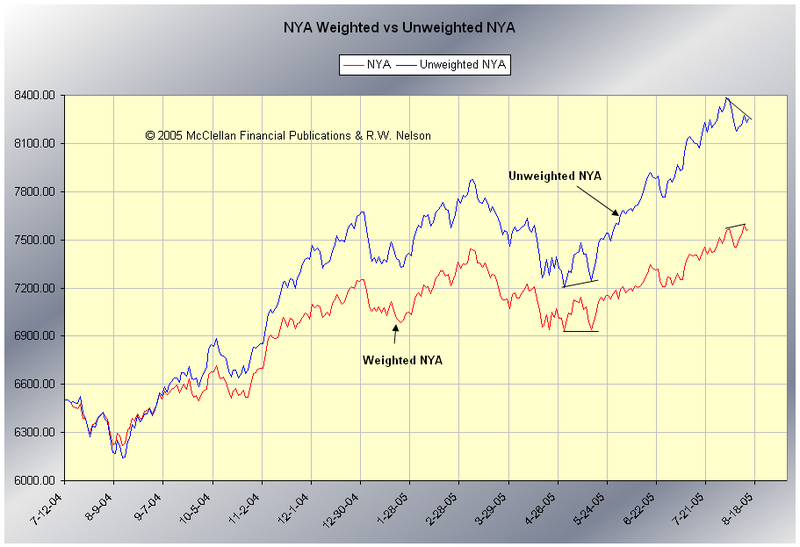 Note the un-weighted NYA index was far stronger than its weighted cousin, but did not confirm the recent new all-time price highs of the traditional NYA index. The short term negative divergence is suggesting additional digesting of the rally from the April lows is needed. The next chart is the common-only cumulative AD line, often posted by Fib. 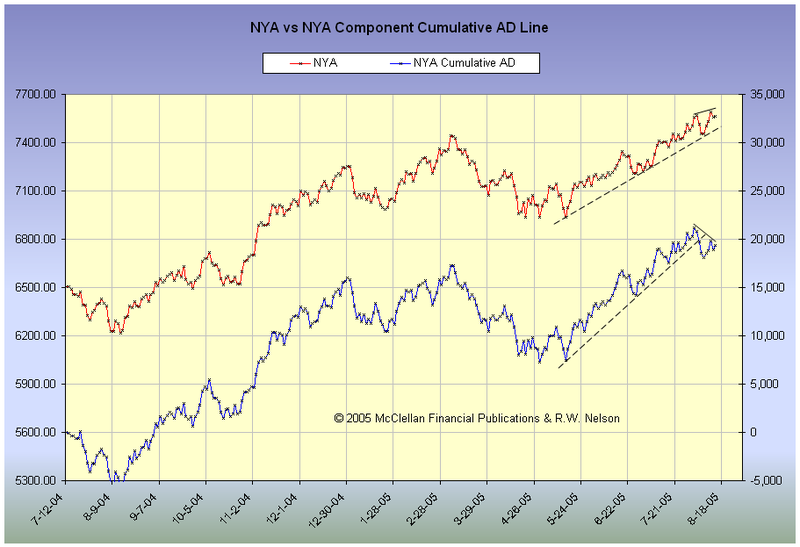 Although the common-only AD line is plotted against the weighted NYA index, note the similarity between the un-weighted NYA index and the common only AD line. Next is the cumulative NYA component $ weighted Up-Down volume line, derived from multiplying the closing price of each NYA common stock by their respective volumes. This indicator failed to confirm the weighted NYA index’s new high as well. The component $ weighted Up-Down volume ratio adjusted McClellan Oscillator (RAMCO) has been warning the internals’ strength of the NYA rally from the late June price lows has not been robust. 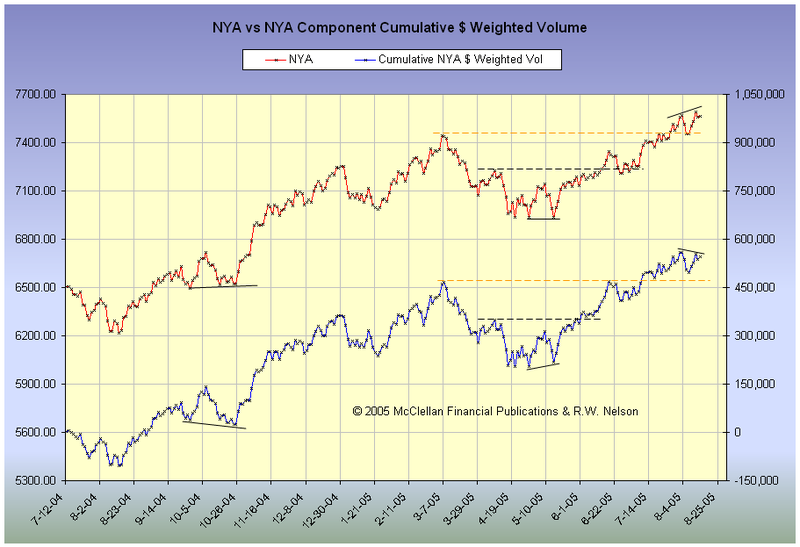 Finally, a look at the NYA component cumulative up-down volume line (not dollar weighted). It is no surprise the NYSE common only cumulative volume line is very similar to the NYSE composite (all 3700 issues) cumulative volume line. The components comprising the NYA common stock only index account for at least 95% of the total NYSE volume on any given day. In summary, additional consolidation/correction work is likely needed before a sustainable rally can continue. For the longer term health of the 30 month old bull market, we will want to see the cumulative internals indicators confirm any future new price highs. If these indicators, particularly the AD line, fail to confirm further price highs, the clock can be started for the likely final leg of the bull from the 2003 lows.